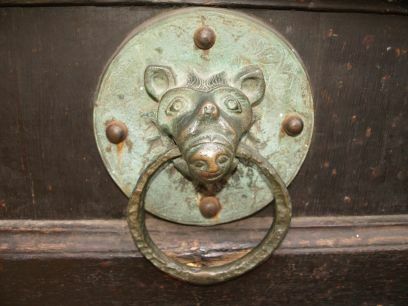 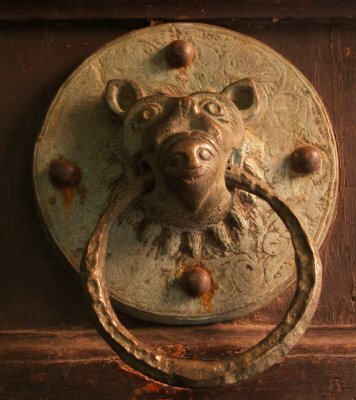 On the north door of All Saints Pavement, York, is a replica of a 12th century Doom Knocker, representing the Mouth of Hell. 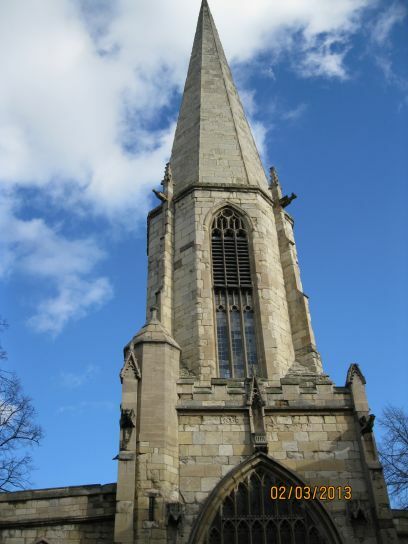 The octagonal tower Parish and Guild Church of All Saints, Pavement. 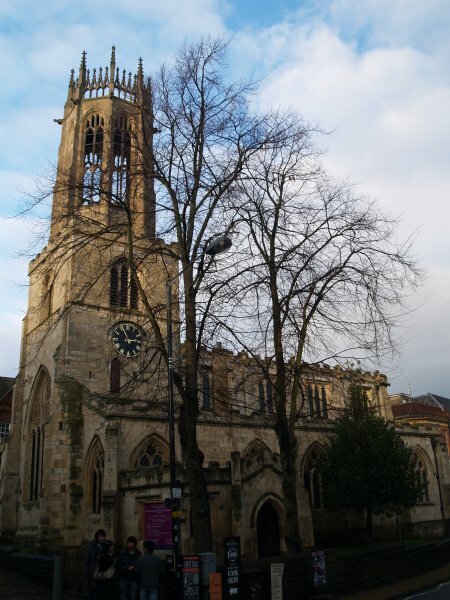 The lantern tower (19th C reproduction?) 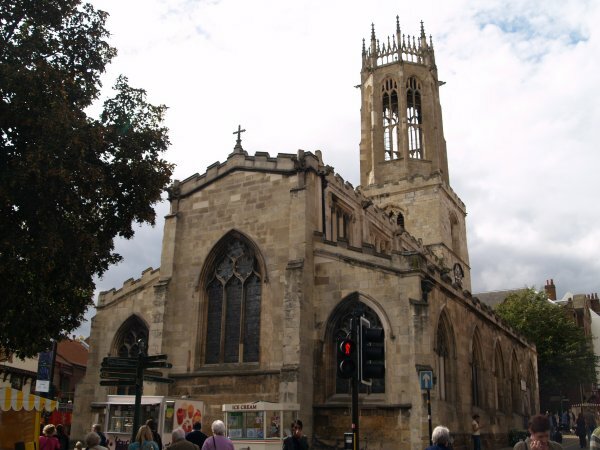 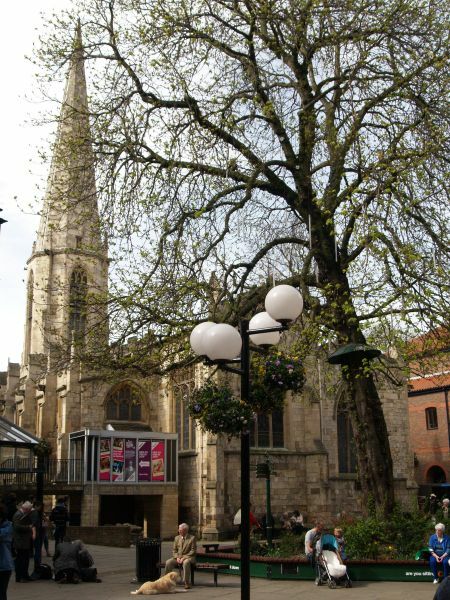 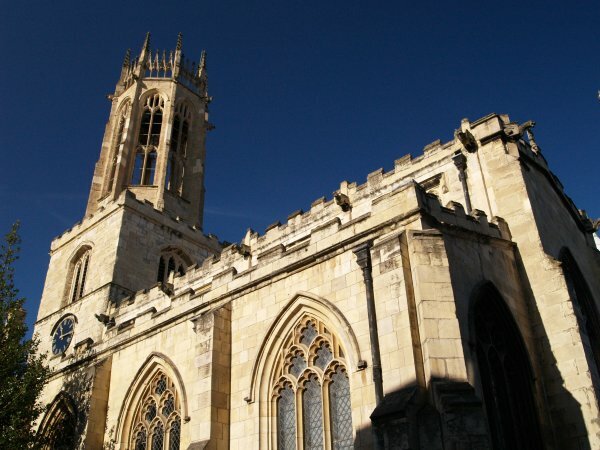 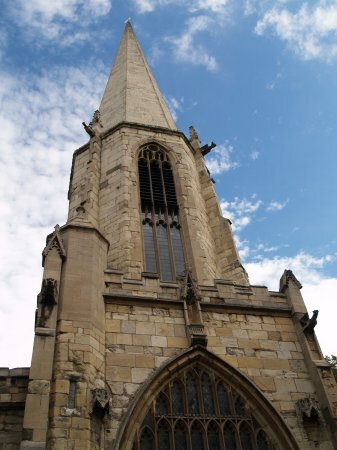 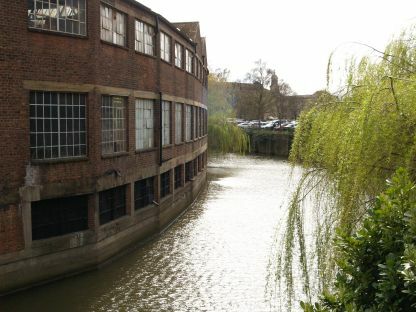 is one of the finest in England and the original medieval octagonal tower would have guided people to York. 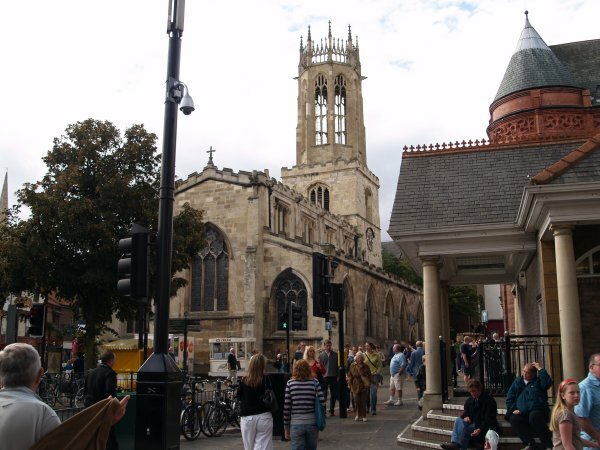 All Saints is just at the end of Parliament Street where it meets Coppergate and High Ousegate. 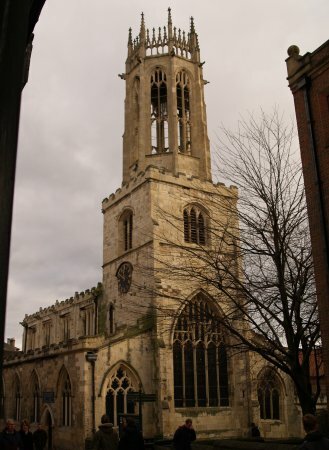 The east end of All Saints, much of the building dates from the 14th to 15th century. 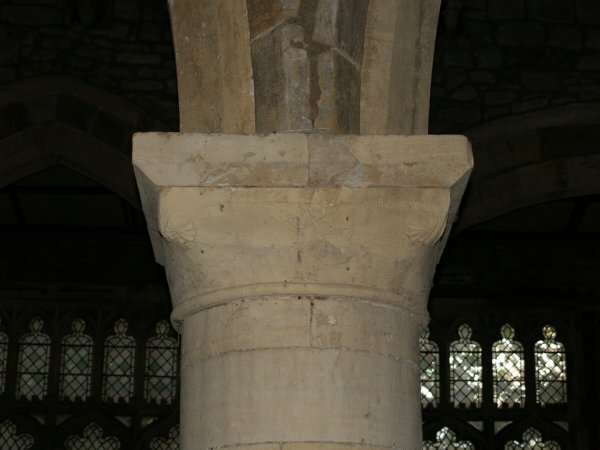 The Domesday Book records a church here in 1087 called All Hallows and in the churchyard Saxon and Danish burial stones have been found. 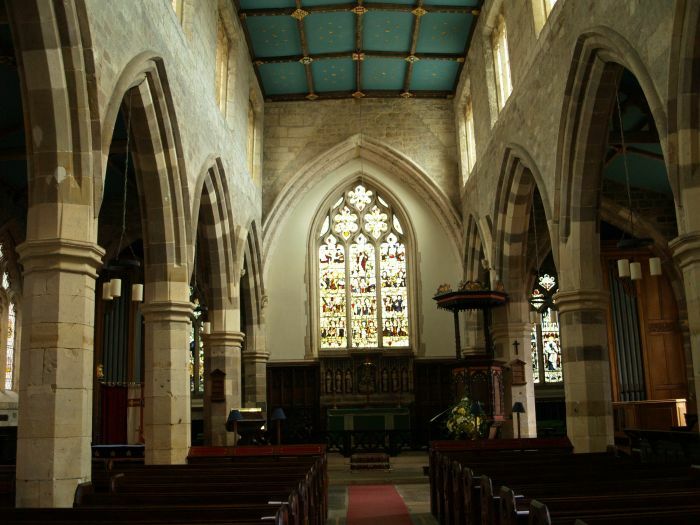 The nave of All Saints, Pavement and the great east window above the altar. 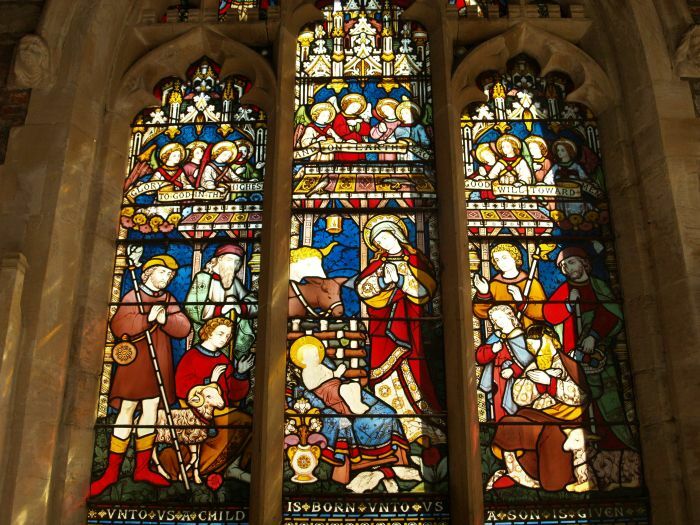 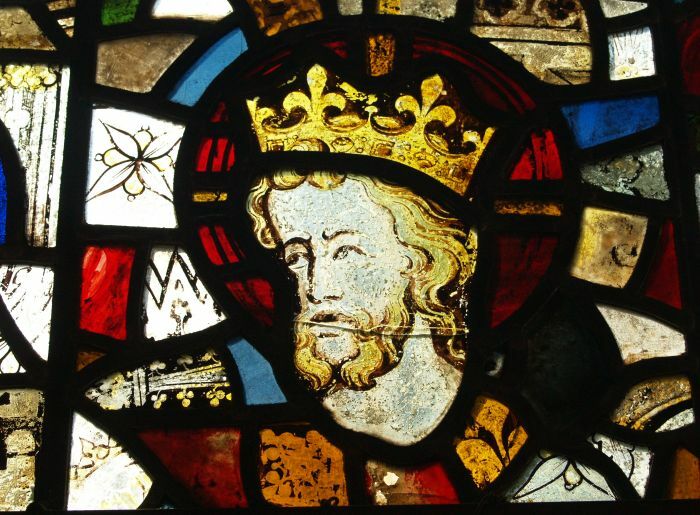 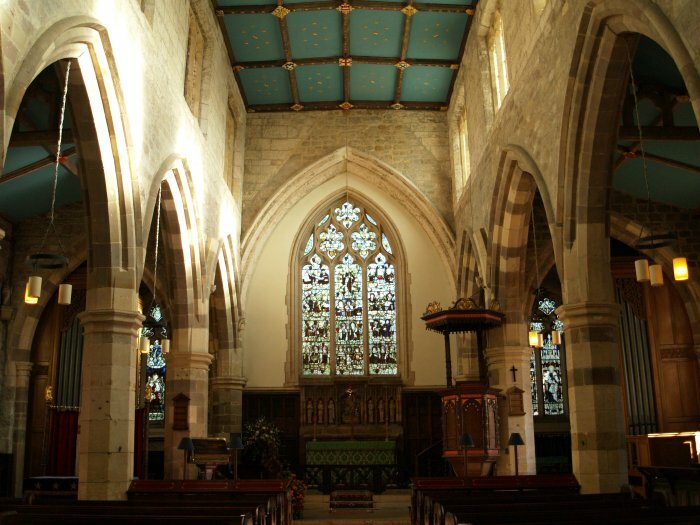 The stained glass is by the celebrated Victorian artist Charles E. Kempe. 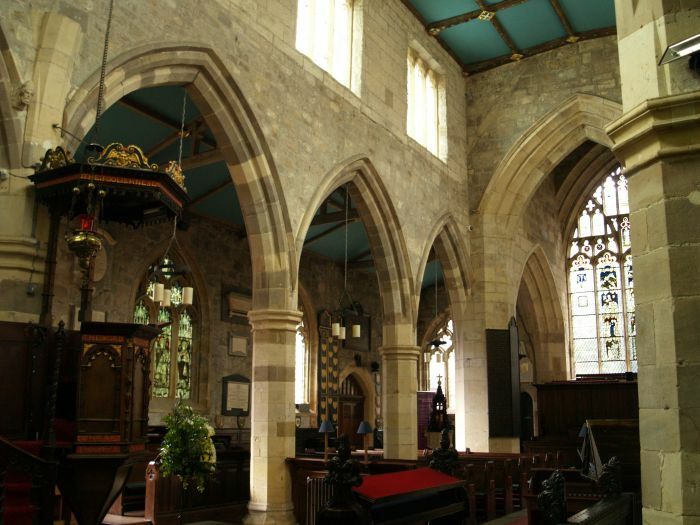 The original chancel was demolished in 1782 to allow more room for the grain market. 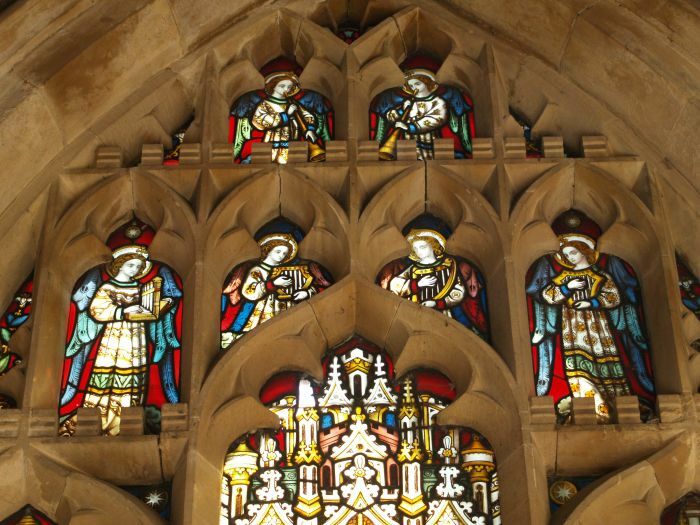 The east window depicts a host of Saints. 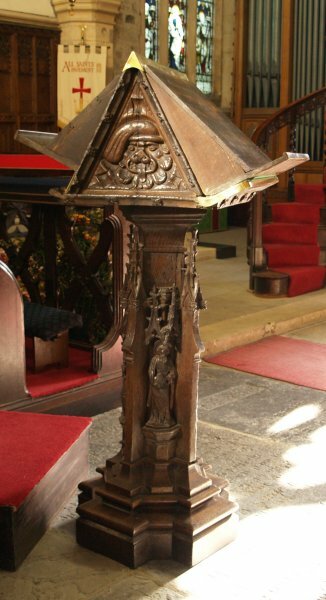 Left: Lectern (details below). 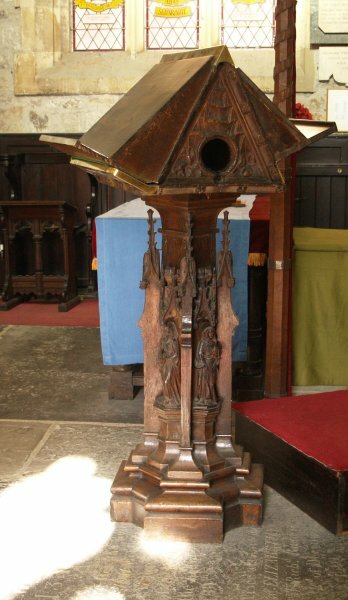 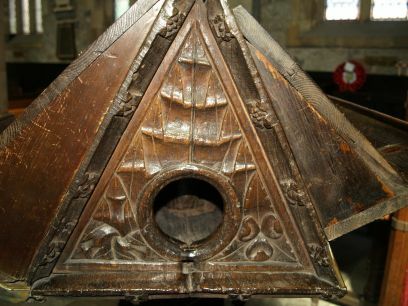 Right: The fine pulpit on the right dates from 1634. 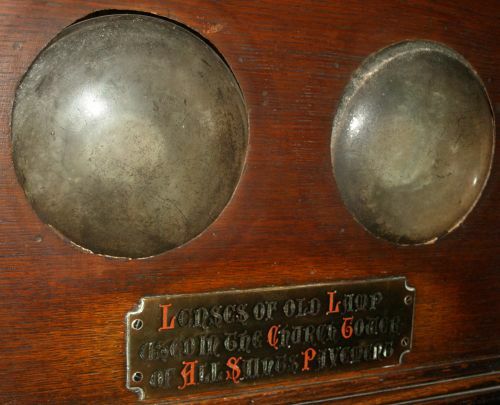 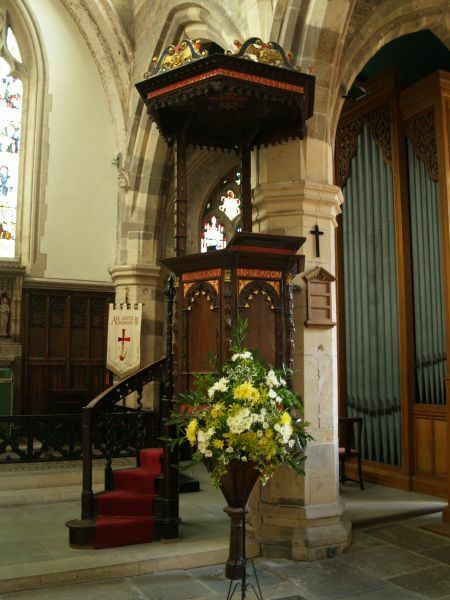 Its canopy, called a tester or sounding board, was meant to amplify the preacher's voice for the benefit of the congregation. 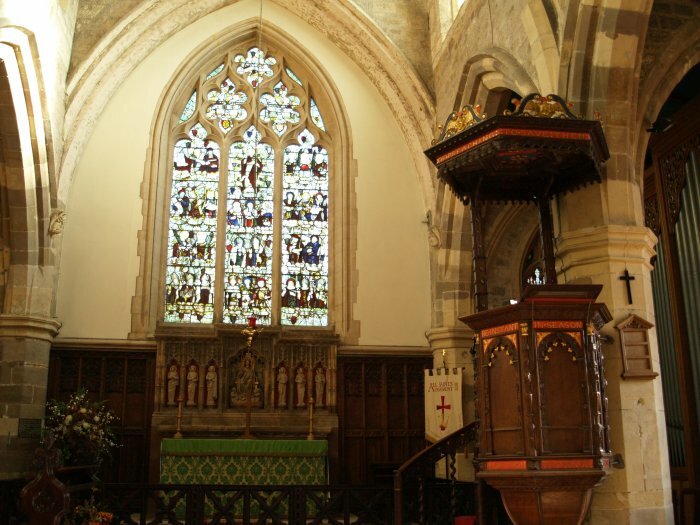 The Anglican clergyman John Wesley (1703-1791), noted evangelist and co-founder of Methodism, preached from this pulpit on several occasions. 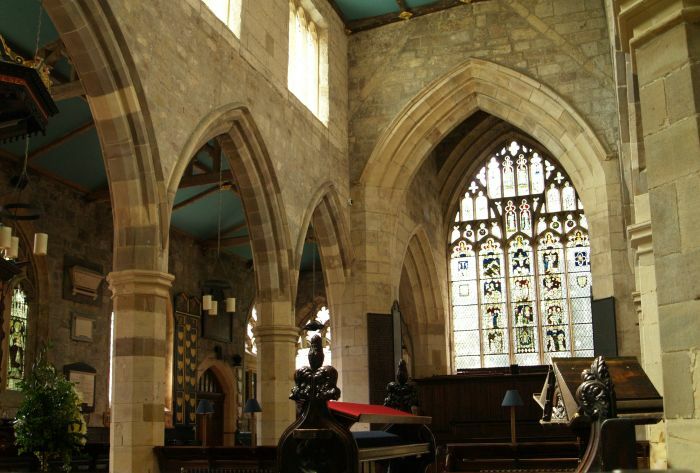 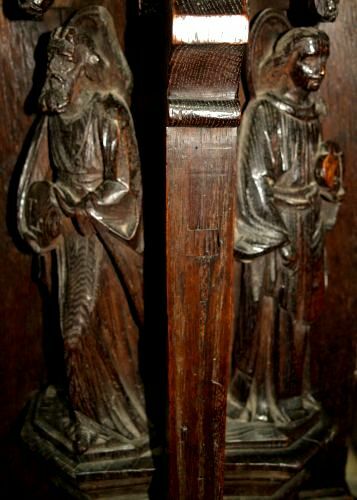 On the left of the entrance to the chancel is a 15th century lectern that was originally in St Crux Church, York. 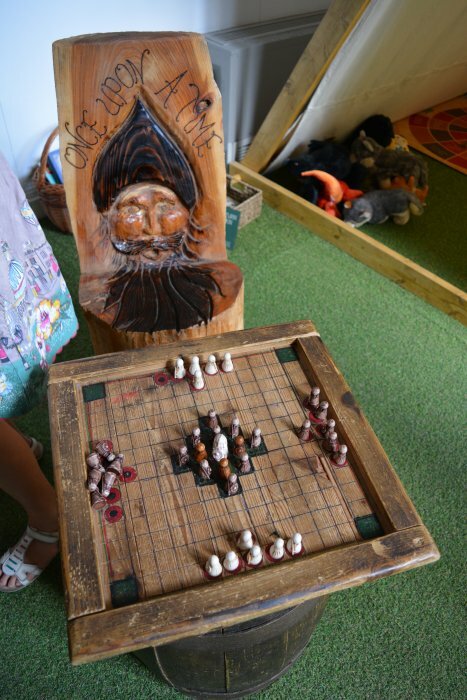 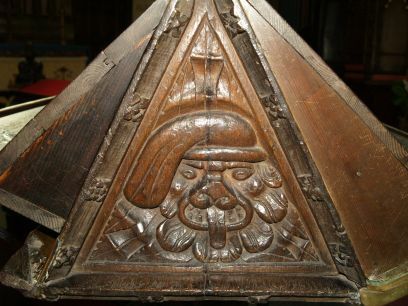 On one side is a hole for holding a scroll of music and on the other is a curious carving of a man with a floppy hat and a lolling tongue (see pictures below). 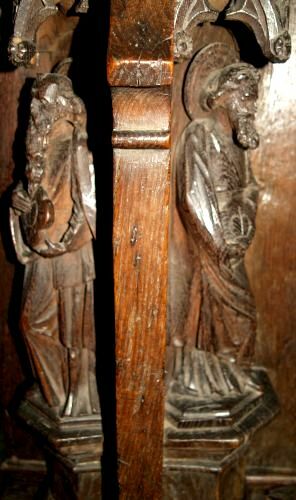 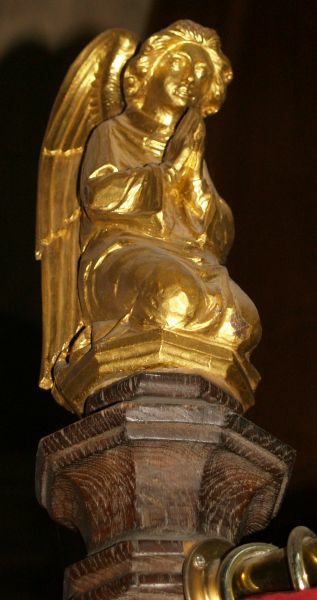 The carved figures on the lectern support. 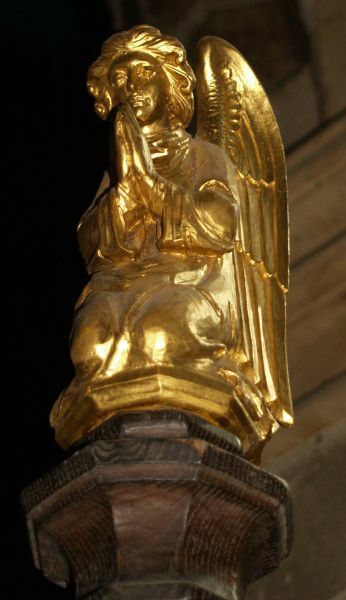 The praying angels at the east end of the north aisle. 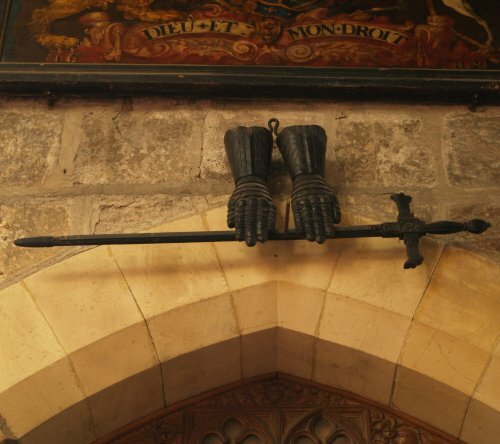 Above the vestry door are replicas of the sword and gauntlets of Thomas Percy, 7th Earl of Northumberland, who was executed in the Pavement in 1572 for leading a rebellion against Queen Elizabeth I. 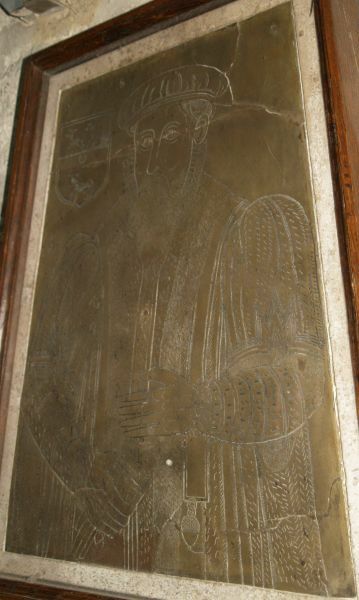 A fine brass panel of ? 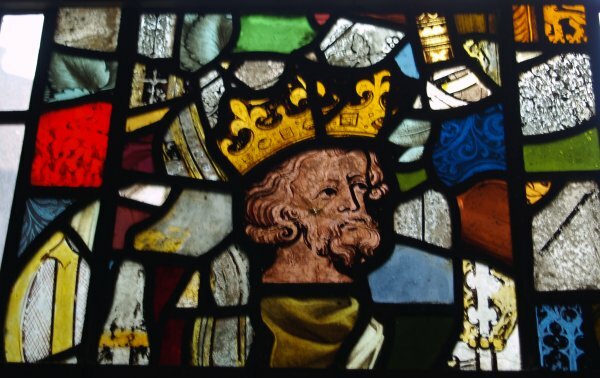 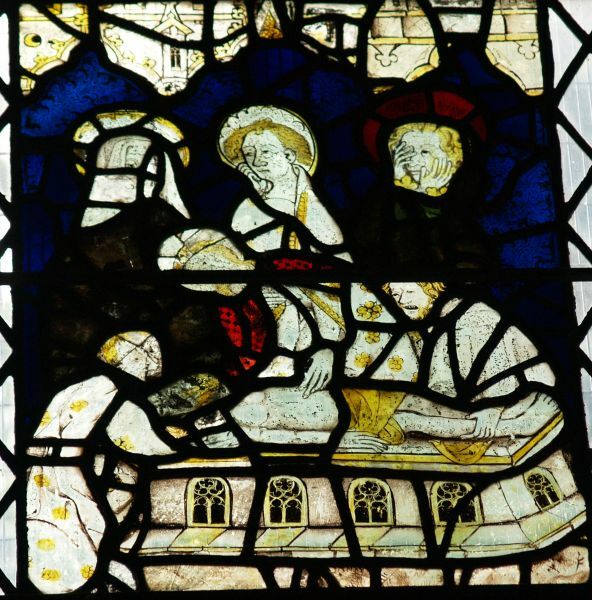 Some medieval glass lenses from the lamp that was once in the octagonal tower of All Saints Pavement Church, which was built~1400. 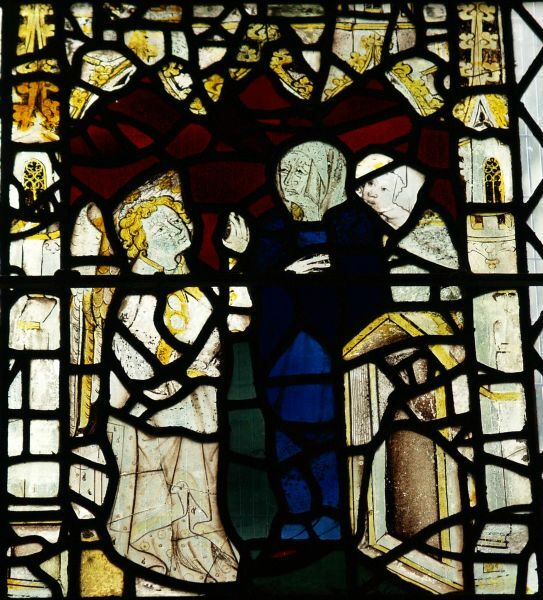 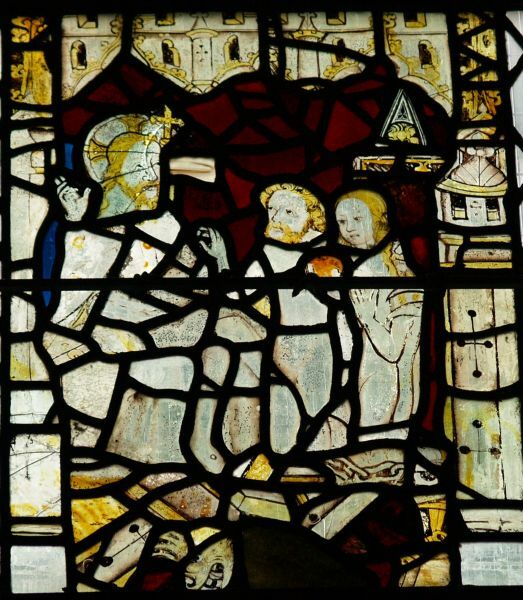 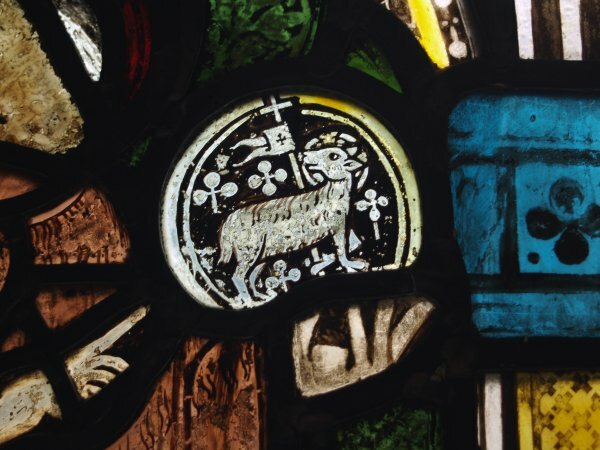 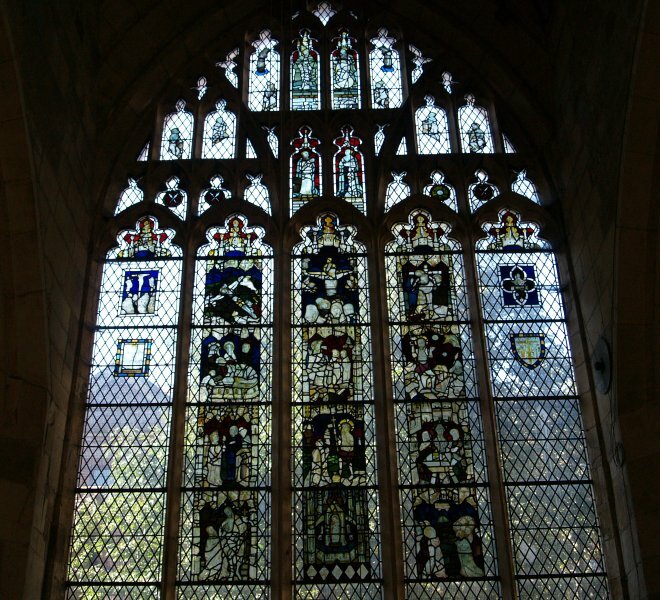 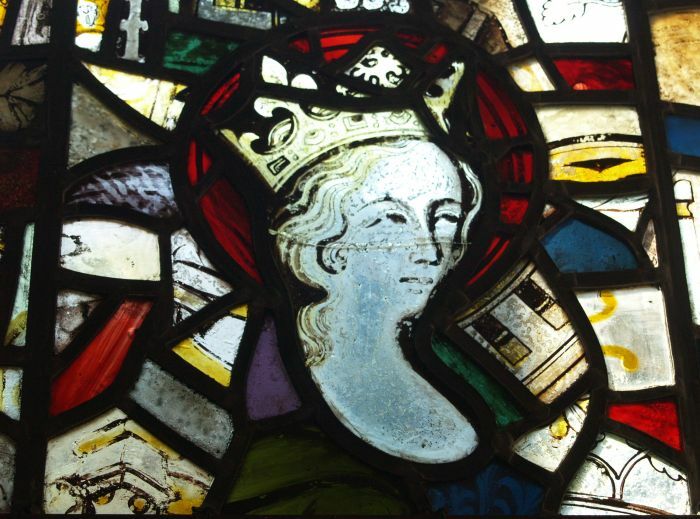 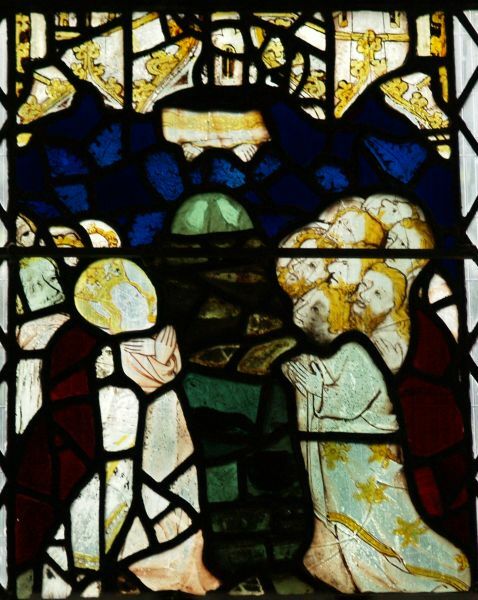 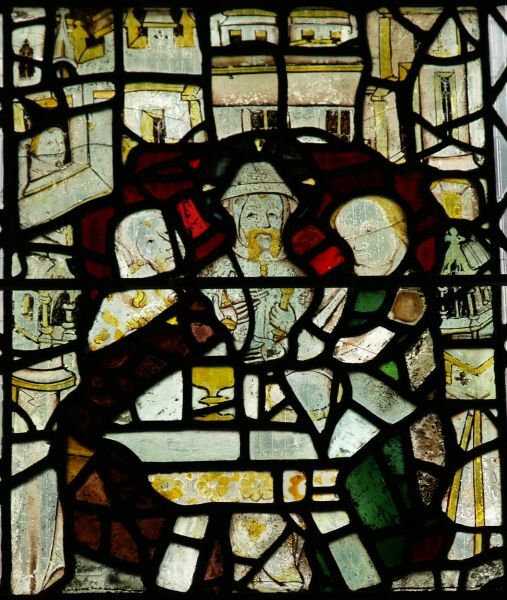 The west window is made of ancient glass from ~1370 comprising a collection of fragments from St Saviour's Church, York. 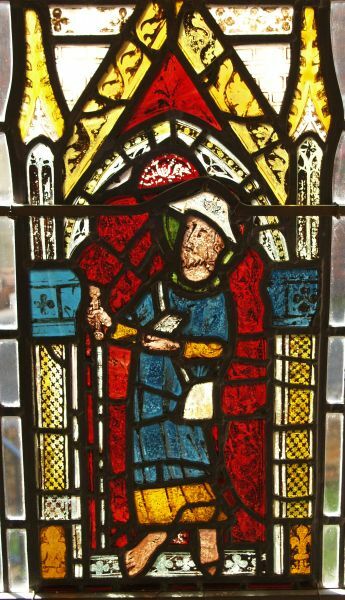 It has a unique series of Passion Panels (more detailed pictures of these 14th century stained glass panels below). 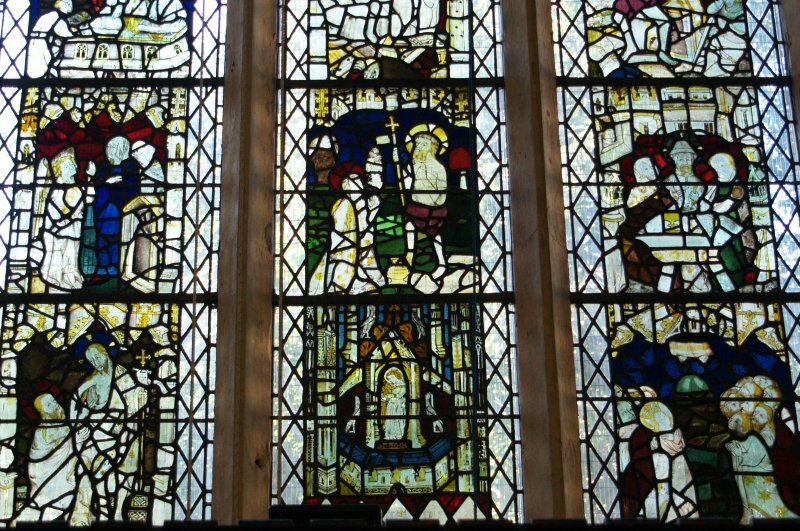 Some details of the stained glass panels of the west window. 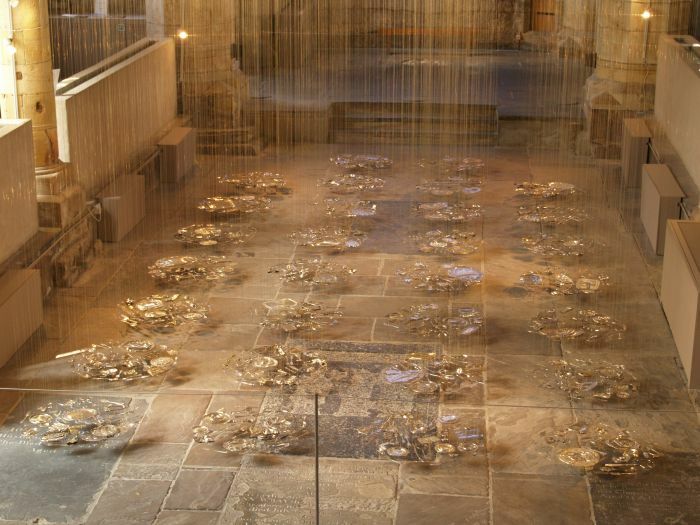 The pictures above and below show The Memory of Place by Keiko Mukaide in 2007. 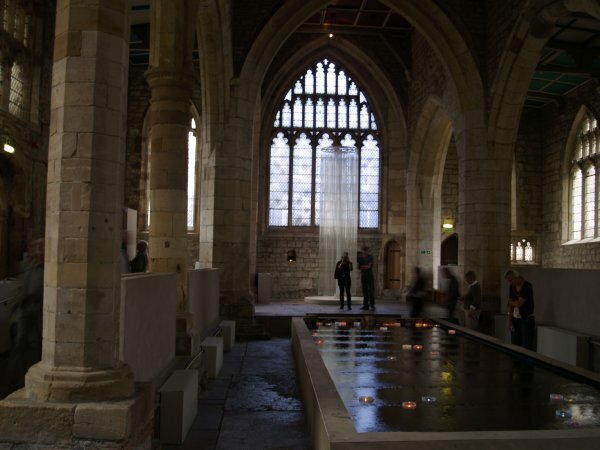 The lighted candles drift slowly down the shallow wide water trough. 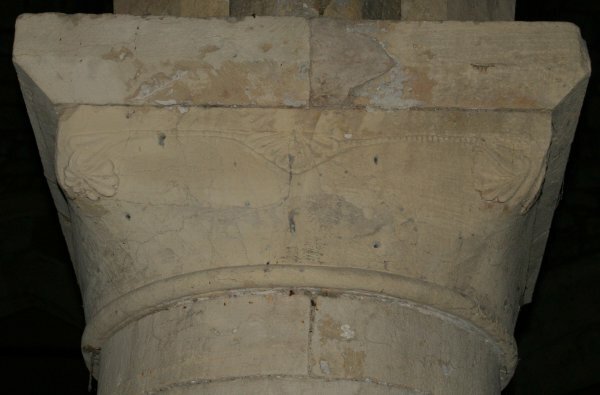 Some fine carving on the capitals. 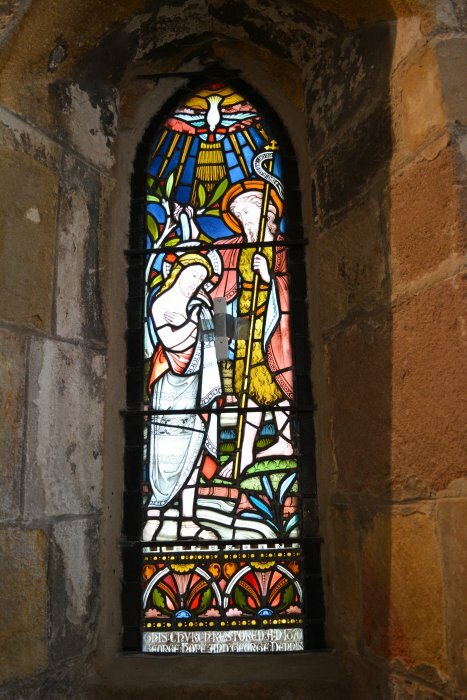 Panes of medieval stained glass in St Mary's Church. 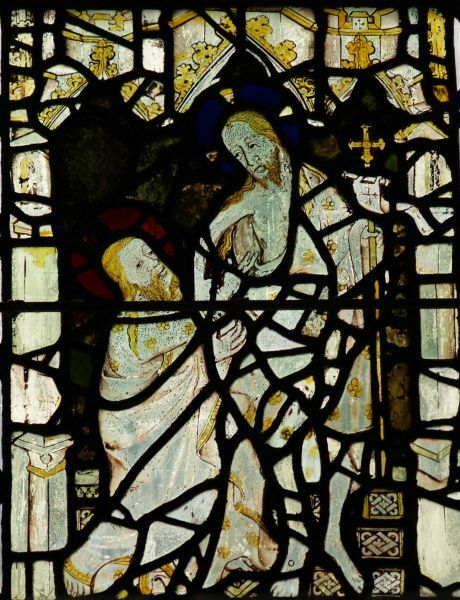 More of the painted glass panels within the medieval tracery of the windows - Victorian I assume? 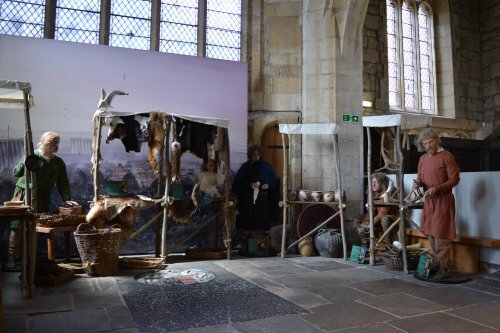 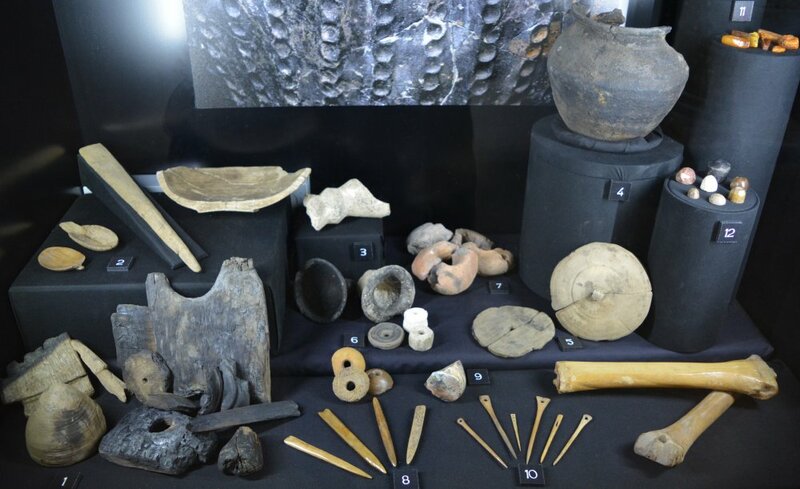 In the mean time, in 2016, various exhibitions on the Vikings are being held around York including St Mary's Church, Castlegate. 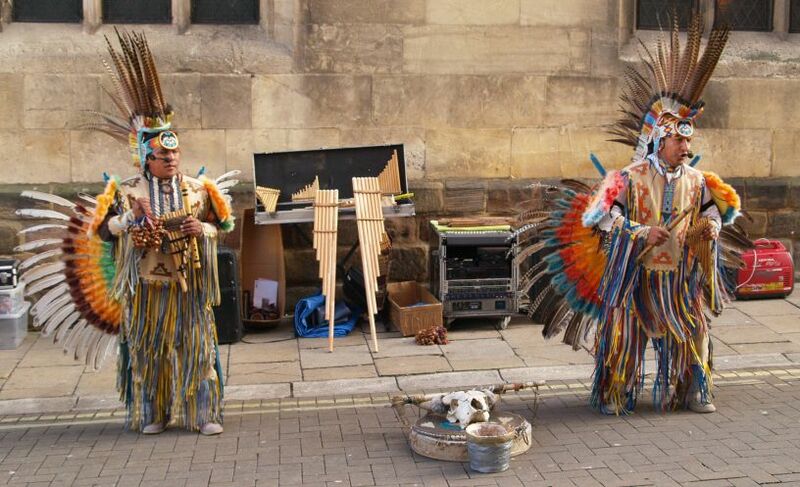 A nice view of two cultures! 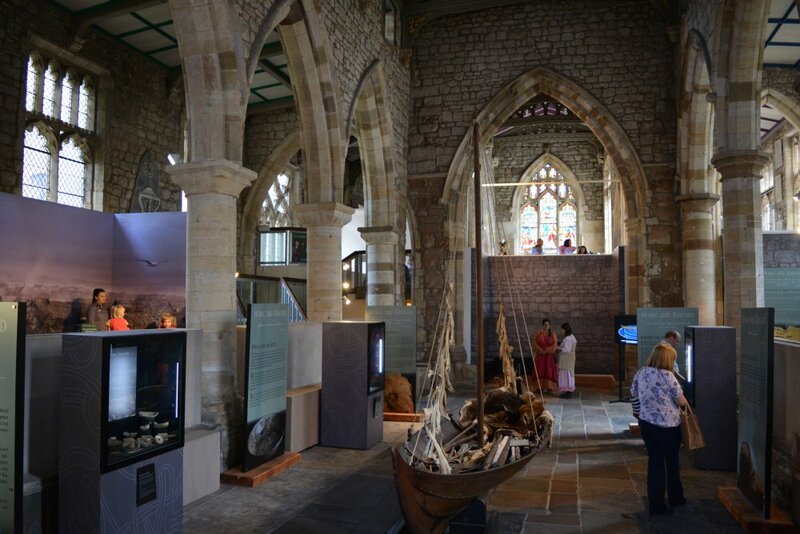 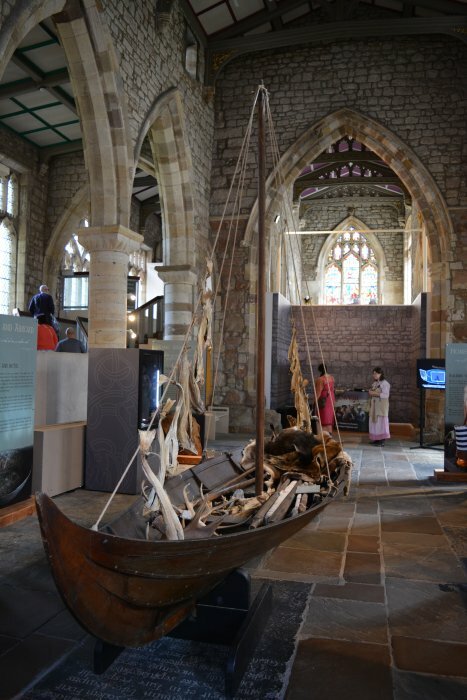 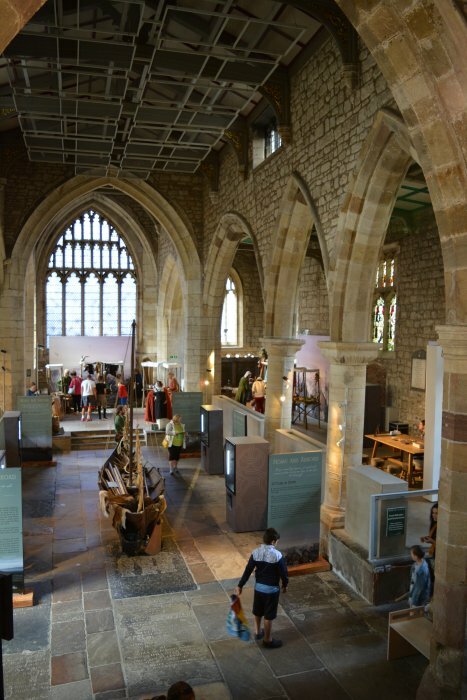 A fine medieval setting for a Viking exhibition! 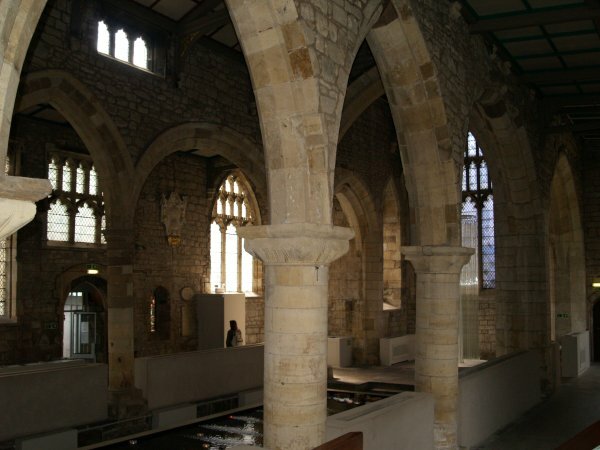 Enter place, feature, church, museum, building, street, anything of interest!